Television existed for a long time before it became commonplace in American homes. Even as cars, jazz, film, and radio heralded the modern age, television haunted the modern imagination. During the 1920s and 1930s, U.S. television was a topic of conversation and speculation. Was it technically feasible? Could it be commercially viable? What would it look like? How might it serve the public interest? And what was its place in the modern future? These questions were not just asked by the American public, but also posed by the people intimately involved in television's creation. Their answers may have been self-serving, but they were also statements of aspiration. Idealistic imaginations of the medium and its impact on social relations became a de facto plan for moving beyond film and radio into a new era. 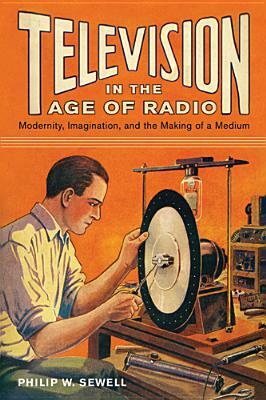 In "Television in the Age of Radio," Philip W. Sewell offers a unique account of how television came to be--not just from technical innovations or institutional struggles, but from cultural concerns that were central to the rise of industrial modernity. This book provides sustained investigations of the values of early television amateurs and enthusiasts, the fervors and worries about competing technologies, and the ambitions for programming that together helped mold the medium. Sewell presents a major revision of the history of television, telling us about the nature of new media and how hopes for the future pull together diverse perspectives that shape technologies, industries, and audiences. Author Name: Sewell, Philip W.